Chintz, circa 1988, as used by designer Brooke Huttig. Found it on a fun slideshow by Southern Living. Now, at first glance, my eye was happy as everything is working well together. A closer look starts to reveal some outdated elements that showcase the room's era, but the foundation is still relevant. 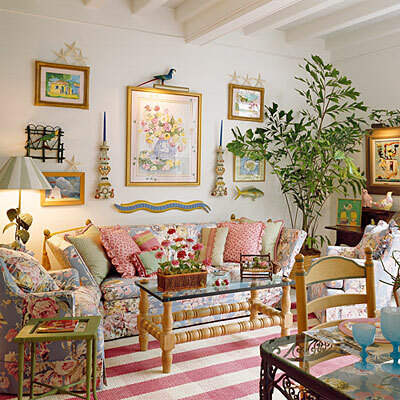 The gorgeous blue chintz on the sofa and chairs, the silhouette of the sofa and chairs, the dhurrie, the gallery wall arrangement, the tree, the awesome architectural ceiling, the juxtaposition of white walls with color and pattern. Give this room a new coffee table, some updated artwork and new pillows and we'd have a pretty thrilling space. And that is what one can hope for in a room - that you've chosen the foundational pieces well so that the accents can change and evolve over time without needing to completely overhaul the space. Daniela you are so right. It does not really take that much for a fresh new update on a room! You are right !It is still a beautiful room, and with a few contemporary updates it will feel fresh again. Chintz filled rooms are just happy, relaxing and for me, timeless. Check out Betsy Speert’s blog, and you will see how livable and timeless such design can be when it is in the hands of a great designer. I just love Betsy, she is truly one of the best designers of all times..
And no, I do not know Betsy personally, but I have her design book and I follow her blog..